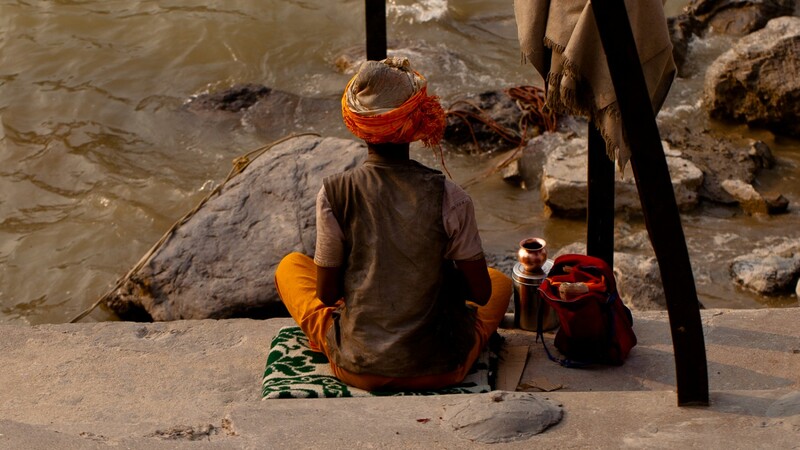 Rishikesh is a spiritual centre, settled around both sides of the Ganges at the foothills of the Himalayas. To really immerse yourself in the place, you would need much more time than the three days we had. We did feel a little out of place in jeans and runners while the majority wandered around in pajamas. Staying in an ashram and signing up to a yoga course are definitely the things to do in Rishikesh – neither of which we felt compelled to do this time round. Nonetheless we were thrilled to see the Ganges and those who came to worship it. There were plenty of restaurants that provided ideal vantage points from which to sip on an alcohol-free drink and take in views of the sacred river. 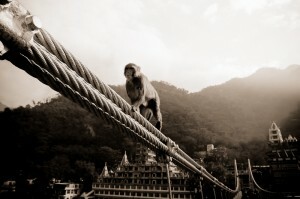 In Rishikesh we had our first encounter with a nasty little monkey on a stairway between two streets. It hissed and growled at us, baring its teeth and threatening to jump from a post high above. We decided to take the long way around, not willing to take on any of the local fauna for the sake of a shortcut, though neither of us were game to look back to see whether it had pursued us down the stairway. The monkeys in general appeared to be pretty clever – we witnessed them going after women’s handbags more than once, taking a particular liking to those of the bejewelled or shiny variety. 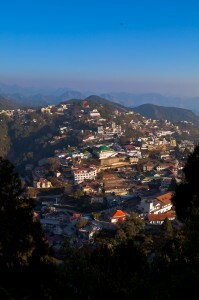 This morning we arrived in Mussoorie, a hill station 2000 metres above sea level that is known as a town popular with honeymooners. It’s pretty obvious when you walk down the street and see couples holding hands in a rare display of affection and wandering around dreamily. At the centre of the town is a cable car that takes tourists up another 500 metres to a viewing platform. Just in case the breathtaking views to the snow-capped Himalayas aren’t enough to get tourists up there, a small amusement park, for want of a better term, is located at the top. The park combines a strange assortment of magic shops and stalls inviting tourists to take aim at a target with either a bow and arrow or a pellet gun. We were drawn into a magic shop with the promise of a few tricks to entertain us and left with a box of 150 tricks for 150 rupees ($3.30) as well as in-depth training for about 20 of the games inside. By the time we had completed our crash course in magic we had an audience of about 30 people outside crowded around to see what all the fuss was about. Upon request, we posed in some photos for the crowd before making our way back down in the cable car.